France Ambassador to Ghana, Frederic Clavier has expressed confidence in Ghana despite the numerous economic challenges. 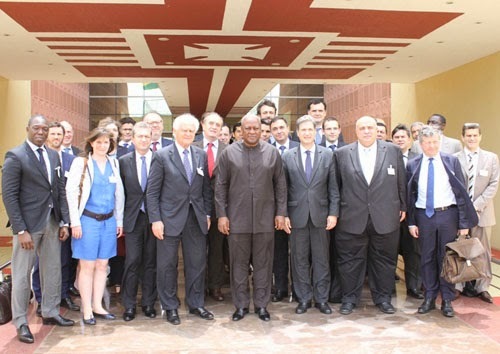 He said France was ready to collaborate with the Government of Ghana to help address the various economic challenges. Mr. Clavier, who made this known at his residence when a French business delegation paid a courtesy call on him, said the partnership would also deepen the bilateral relationship between the two countries. The delegation, made up of representatives of about 37 companies in various sectors like energy, transport and logistics, industrial projects and banking and financial services, among others, was in the country to explore investment opportunities. “The French Government is very confident in the future of Ghana. We have delivered the message that we have to partner by investing now in Ghana. “We know that the competition is much opened and many stakeholders are participating but France has many qualities in terms of quality of service,” Mr Clavier said. France is currently investing over $1.2billion in bilateral trade with Ghana, and it plans to double that amount in next two years. The envoy revealed that French business represents only three percent of the market in Ghana and “that is why we do need to have more partnerships. “We came to see what type of joint ventures that can be made with the Ghanaian companies so as to accelerate this capacity for the French companies and to create jobs in Ghana. Chairman of the African Committee for MEDEF International, Patrick Lucas, who was the leader of the delegation, said once the current energy crisis has been resolved, the investments of Ghanaian and French industries as well as European would increase. “Energy is the key issue to facilitate the development of the economy in years to come. We know the difficulties you are facing but we know as well the possible and potential you have got subject to a few problems that can be solved. “With energy and infrastructure, it is possible. Once it has been done, it will open a way for Ghanaian industries as well as French investment and surely European investment,” he said.